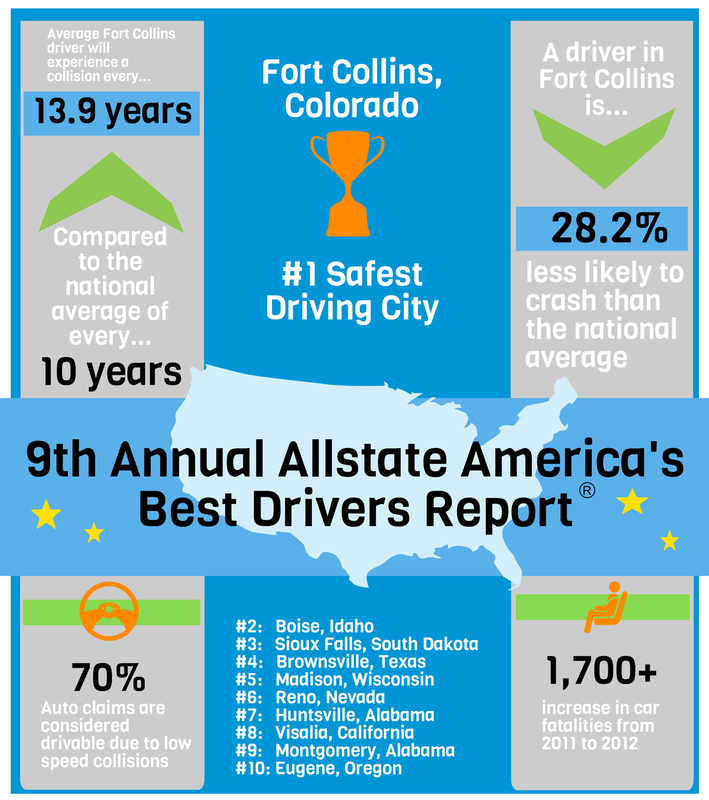 Fort Collins, Colo., is back on top of Allstate’s annual “America’s Best Drivers Report,” which ranks the country’s 200 largest cities by how often Allstate drivers there file accident claims. Washington, D.C., once again took its usual spot at the bottom of the rankings. The report, which looks at how often drivers in different cities file collision claims, found that the average Allstate driver files a collision claim about once every 10 years. In comparison, drivers in Fort Collins file a claim only about once every 13.9 years. Drivers in Washington file a claim once every 4.8 years, about twice the rate of the national average. According to a news release from Allstate, Fort Collins has grabbed the top spot three out of the nine years that the report has been produced. On the other hand, Washington has been ranked the worst city for safe driving in seven out of the past nine reports. Washington was overthrown only in 2005 and 2006, when Newark took the bottom spot. Why is there such a big difference between cities like Fort Collins and Washington? “Different levels and types of traffic, noise and activity, as well as varying road conditions and rules, can make big city driving different than driving in smaller cities or more suburban areas,” according to Allstate. As a result, drivers in packed cities like Washington get into accidents more frequently, while cities like Fort Collins and Boise that have less congestion get into accidents less frequently. Luckily for drivers in cities like Fort Collins and Boise, a better claims history also likely means better auto insurance prices.That’s because most insurers use territorial rating in their pricing structures. With territorial rating, insurers take a policyholder’s address and look at how often other policyholders in the same area file claims. If drivers in a policyholder’s area file claims less frequently than other parts of the city or state, that policyholder will likely be rewarded with lower insurance prices. Of course, the opposite is also true, to the chagrin of Washingtonians; if you live in an area where people file claims more frequently, you’ll likely see higher rates. That’s evident in how much drivers in the nation’s capitol end up paying for coverage. According to the most recent data from the National Association of Insurance Commissioners, Washington, D.C., has the second-highest average car insurance premium in the country. In 2010, the average expenditure there was $1,128, which is more than $330 above the national average. All of the top 10 safest cities have the advantage of being on the small side; all of their populations are under 250,000. This works to their advantage because places with smaller population densities tend to see fewer accidents.